A good blog design keeps your readers hooked right from the beginning. Clean, simple, and professional blog designs are always pleasant to the eyes, and it feels better to read an article with that setup. Personally, I prefer reading a blog which has a simple blog design, right color combination, readable fonts, good font size, visual elements, and proper call to actions. But, there are a very few bloggers who think like me. Many of them would prefer to go with a design which is cluttered, rainbow-colored, non-readable, and full of annoying things. Why Focus on Blog Design? High Bounce Rate: A bad design would affect the bounce rate of your website as visitors will find it damn easy to close the window. Read more about Bounce Rate. Less Conversion: Who would like to make a sale or submit their email information to a sad looking site? I won’t. ​Less Social Shares: If your readers didn’t enjoy your blog, why would they share it? People only share the things they enjoyed and consider share-worthy. And lots of complaints: And the last common problem you’ll face is complaints from your customers. “I can’t read, there are too many ads, I can’t close the popup, your site wouldn’t open in mobile, and so on. Get ready to hear’em all out. With handy access to WordPress, it’s so much easier to install a professional personal theme that would be loved by your readers. There are thousands of professional themes available for every niche for different prices ranging from free to as high as thousands of dollars. What To Look in A WordPress Theme? Budget-friendly: The first thing first, the theme shouldn’t cost more than $100 unless it is really out of the universe. Search Engine Optimized: Theme should be SEO friendly, i.e., with proper coding and structure. Easy To Customize: We all like to be unique. Hence, the theme should be easy to customize with colors, fonts, and look. Mobile Friendly: The mobile market is growing at an astonishing rate. You surely don’t want to get left behind. Fast Loading: The loading time of your site will very much depend on the request it makes to the server, image optimizations, and scripts used in the theme. A good theme will ensure fast loading of your website. Some additional features like inbuilt page builder, ads management, multiple language support, and the deal section are preferred but not must-haves. In this post, I’m sharing my list of top 10 best WordPress Themes for personal blogs. 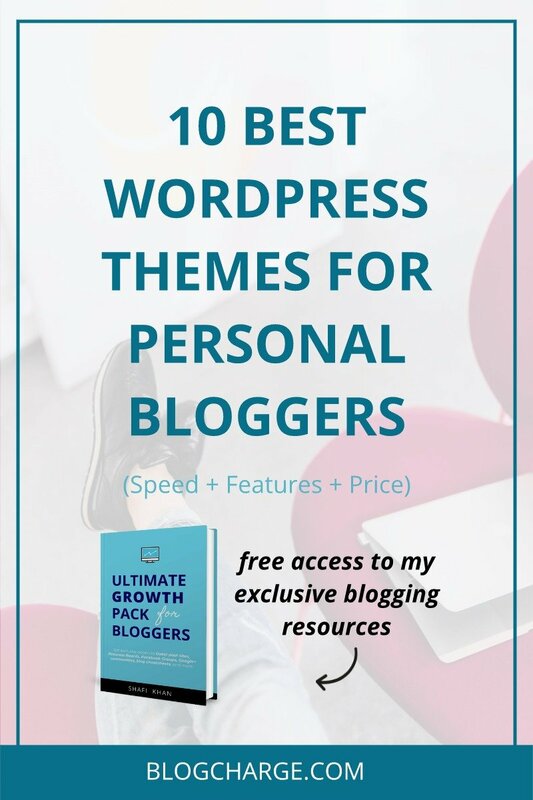 I have used most of the themes in the list personally or else have seen someone using them on their blog. So, let’s get started now. If you are doing a fresh install of WordPress in 2017, then it will be the theme with which your site goes live. There aren’t tons of option to customize, but you can play around with basic settings using Theme>Appearance. Overall the theme looks minimal, simplistic, and is excellent for personal diary blogs. Looks incomplete if not customized correctly. 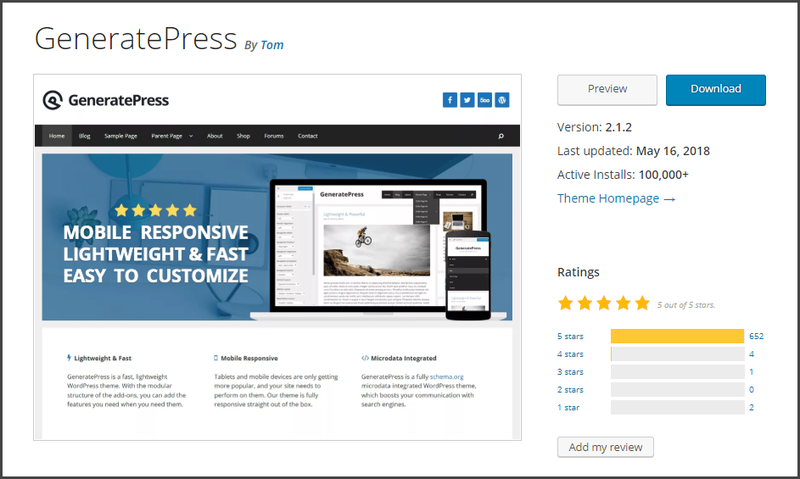 If you’re looking for a free theme which looks excellent and is coded with best practices, GeneratePress should be your go-to choice. I recently switched to GeneratePress and I’m more than satisfied with the quality. It is coded by Tom Usborne – a well-known WordPress developer. The free version is available on the WordPress Repository with 100,000 active installs and 5-star ratings. However the features are limited and to enjoy the maximum potential, there’s a GeneratePress premium version available. For $39.99 you’ll get access to 15 premium add-ons and pre-made templates. I’m currently using GeneratePress so you can browse the site to see the functionalities yourself. Schema from MyThemeShop is one of my all-time favorite WordPress theme for new bloggers who want a fast loading, responsive, and SE optimized theme. The theme is easy to customize like all other MyThemeShop themes with a custom theme panel. Schema is also dubbed as one of the fastest loading SEO theme and in my experience that has stood true. Inbuilt features like rich snippets, social media buttons, code editor, etc. save you from installing separate plugins for each of the mentioned functionality. Very common among bloggers. So, your blog design may not stand out. Genesis is one of the most popular frameworks among bloggers and web developers. It allows you to create your own child theme and customize it in any way you want. But not everyone knows how to code a child theme, and that’s why you use pre-built child themes. Magazine Pro is a minimalist, professional looking, and SEO optimized WordPress child theme to be used with the Genesis framework. 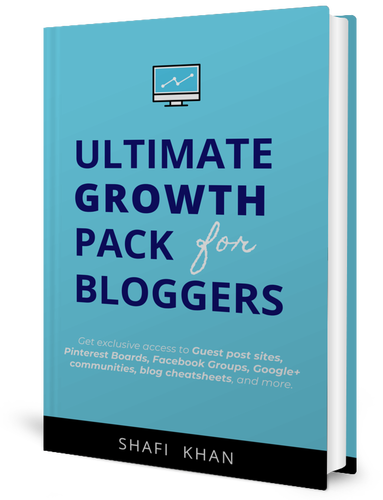 Genesis + Magazine Pro theme is quite popular among personal bloggers who want to keep things minimalistic. Theme customizer is there, but there aren’t too many options available. MyBlog is another good theme for personal blogs with a clean design. It comes with almost all of the necessary features a blogger may need like different homepage layout, footer widget, social media buttons, and more. Not regularly updated. May stop working correctly with future WordPress updates. 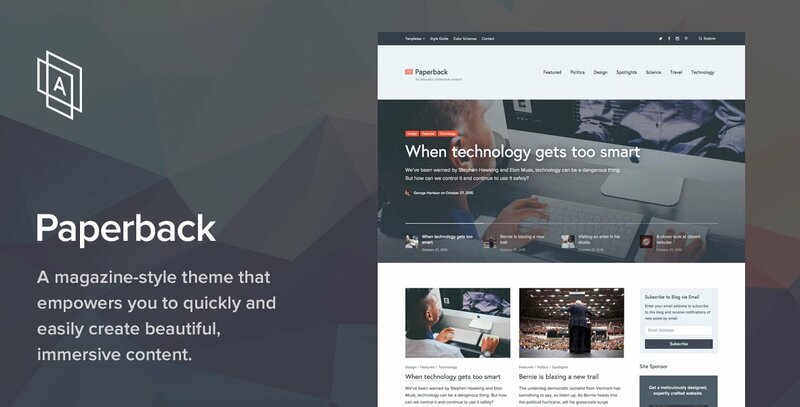 FocusBlog is one of the masterpieces created by Thrive Themes. You may have already seen it on various popular blogs. The theme is best suited for internet marketers who want to collect email subscribers. The theme converts really well and looks comfortable on eyes with a lot of white spaces. Automatic page generator is included which allow importing beautifully designed pages. 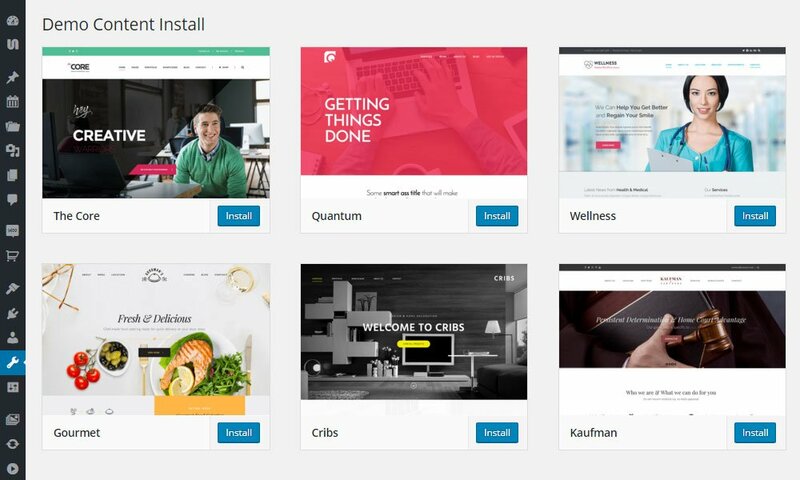 If you’re not on a tight budget, go for the Thrive Themes subscription, and you’ll get access to all the themes and brilliant plugins like Thrive Leads and Thrive landing pages. Thrive Membership starts at $19/month. Popular and ordinary against bloggers. Your blog design may not feel special and unique. Beginner is focused on the blogger’s needs, and it stands true to most of them. 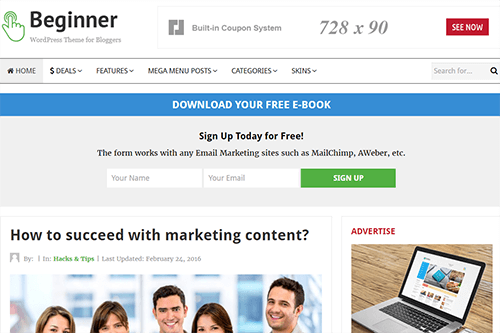 With a Newsletter Header Form, it is easy to capture subscribers. The theme has a built-in ad-support meaning you can display various types of ads using widgets. The Unique Selling Point (USP) of this theme is the built-in Coupon System. You can create a custom deal post and show them right on your homepage. Also, the all-themes subscription of Theme-Junkie is one of the cheapest in the market. It costs $49 per year which is worth every penny spent. And with occasional deals, you can get it for 60% OFF the regular price. No custom theme option. You can only customize it by navigating to Theme>Appearance. 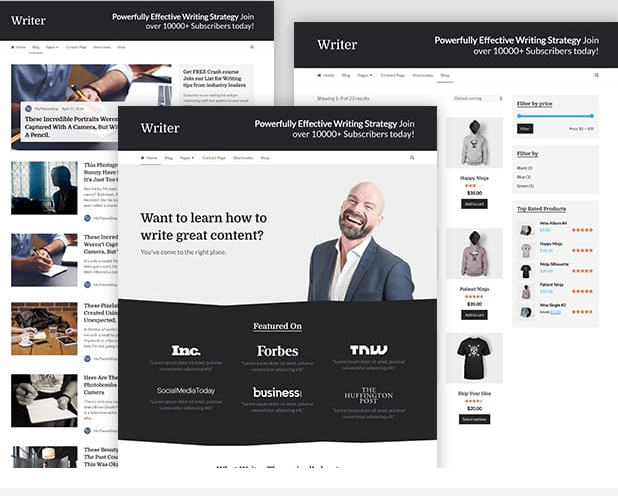 Writer theme is again one of the best-sellers from MyThemeShop. It is built specifically for bloggers, journalist, and professional internet marketers. If you want a homepage design which will convert at a better rate, you can opt for Writer theme. Only one predefined homepage layout is given, which might not be loved by all. Suitable only for professional bloggers. SoleDad is for everyone. 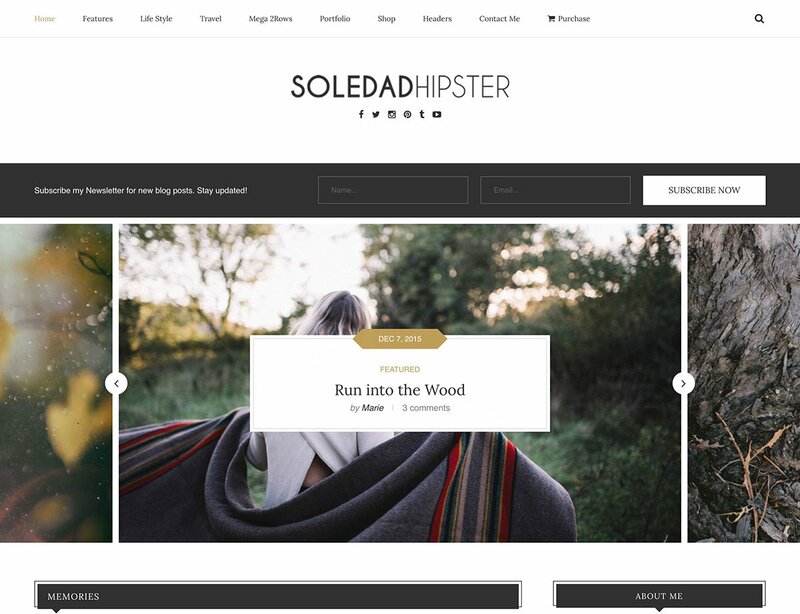 No matter in what niche your personal blog is, SoleDad has got you covered. It is one of the most popular themes available on ThemeForest Marketplace. The best selling point about this theme is premade homepage designs. There are 900+ homepage designs available to choose from, and it certainly helps if you need some inspiration. It also comes bundled with Visual Composer (worth $34) to help you create beautiful pages. The theme is big in size and may slow down your website if you’re on cheap shared hosting. Much like SoleDad, The Core is also a multipurpose magazine style WordPress theme for personal blogs. It has over 20 website layouts each focused on a specific niche. Apart from being customizable, The Core plugins come with many freebies worth over $100. One of the unique features of The Core is that it is compatible with BuddyPress – a tool to allow you start a forum or convert your site into Social Network with multiple users. 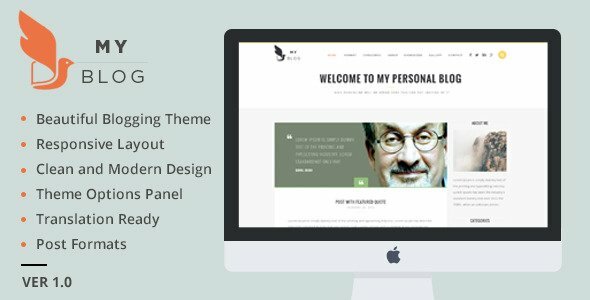 Paperback from ArrayThemes is one of the most elegant themes for business-oriented personal blogs. It can be a good choice for writers who want their blog to look professional. The theme is easily customizable and also supports real-time theme modifications. Best perk of Paperback is its typography which looks classy on every screen type and device. Out of all these themes, here are the top three themes I personally love. It is not like they are the only best WordPress themes, but yes, they are pretty great for every niche. Don’t agree with me? You don’t have to. Let me know what are your top picks and if there’s any theme missing from the list? A beautiful blog design makes a lot of difference in your reader’s eyes. Also, it’ll help you increase your conversion and get more targeted traffic. 👉 Google+ Communities and a lot more. Hurray! You did it. Please check your inbox for further instructions. We guarantee that your email won't be used for spamming or shared with anyone else. It would be great to hear your opinions about my blog design. Share what you’ve got in the comments section below. What theme did you like the most? Or if you have used them earlier then do share your reviews. Finally, don’t forget to share this post with your friends and followers. Hostinger Review: How Good Is This $0.8/Month Web Hosting? CheerUp labels itself as a theme suitable for a wide variety of blogs. Although CheerUp has a lot to offer, you’ll want to appreciate its general style to justify taking a closer look. If you’re looking for a striking, minimalistic design driven by the heavy use of imagery, it’s certainly an option worth considering. Great collection of themes. I have recently changed my theme and took a lot of time to finalize on the one. At those times I feel like I knew more coding so that I could customize it to my liking. Iconic One is my all time favourite theme. Great list of WordPress themes. My favorite is Thrive themes. It is a robust WordPress theme comes with great features and services. Generatepress is also a great plugin and loads very fast. These themes are definitely help users to make their blog looks more professional and SEO friendly. Thrive Themes is my favorite too when it comes to building a niche site. But, the only thing they lack is customization. There aren’t many features to customize Thrive Themes and you’ve to custom code it. GeneratePress, on the other hand, is lightweight and have tons of customization option. It also works pretty amazing with Thrive Architecture, so no problem there. Thrive Themes have actually stopped selling themes and are launching something better. Let’s see what they have got. As a WordPress beginner, I can,t realize which is ( health and weight loss tips blog) the perfect theme for me. If you have a huge idea, please help me. I think no 4 (Genesis + Magazine Pro) is best for me but I am confused. You can go for Genesis + Magazine Pro, Thrive Themes, or GeneratePress. All these themes will work great for the said topic. Sir , someone send me a link to get Newspaper theme for free, should i use that theme for free ? The theme could have backdoor scripts and malicious codes. I won’t recommend to use it. This information has really helped me to choose a theme that will be of value for my blog. Thanks for the insights. Great job Shafi! Thanks for sharing these wonderful list of themes. You can try one another fully responsive WordPress theme called Bloggers Lite. It is very simple, user-friendly and elegant free theme that can be used by personal bloggers, writers and authors. It has bristled with pixel perfect design, custom page templates, 3 different blog templates and lots of other great features. Your Template list is amazing for new blogger using WordPress and will try to add a one or two from this list. Which one is your favorite, Rakesh? I’d love to hear your opinion. Hi, Shafi very good and helpful article, thanks for sharing, love it. Hi Bhavna, glad you found it helpful. Keep visiting.